I no longer need a dedicated e-mail server. Ad sponsored e-mail (such as Gmail) is more than adequate. I no longer run my own web sites. I switched to WordPress.com and it provides all the features I need for my personal and professional blogging. I no longer resell web hosting. It was worth trying, but I do not have the time to invest all my energy into promoting it. At most, I generally broke even with it. I only still need to own my own domain names and I can do that much more economically with other domain companies. In order to move over these domain names, I need to turn off my private registration with GoDaddy and unlock my domains before any transfer takes effect. 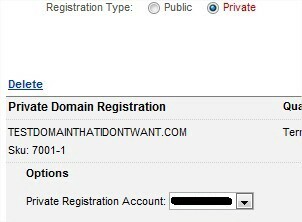 GoDaddy handles private registrations using their own domainsbyproxy.com address. They make it seem like it’s a totally separate company, but it is not. In order to turn off your private registration, you need to log in at domainsbyproxy.com (henceforth known as DBP in this article) and use their own customer name or ID number and password. What is that information? Good question… long standing GoDaddy users never received an e-mail like new subscribers letting them know what that information was. If you don’t know what your customer ID or password is, there is a three day manual verification process where you need to give them some photo ID (such as a drivers license). This makes sense to protect your account if you’re trying to pretend you’re someone else… but I know that I own these domains, and this is a roadblock for me. I searched all over for these DBP e-mails, but I do not have one. I save ALL my e-mail. I know I would not delete these. I just think my account is so old, I never received these e-mails, and they never bothered e-mailing this information out when it was changed. GoDaddy now has me by the proverbial jewels because I cannot transfer my domains out from under GoDaddy until I turn off private registration. Also, I cannot remove private registration from GoDaddy’s control panel when it comes time to renew, because they do not give you a choice to remove it from your shopping cart. I decided to hit the Internet and see who else was griping about this… turns out there were a lot of people. Along with the gripes, I also came across this blog post with a very handy solution. You can find out what your user ID is from GoDaddy provided you go through the motions of pretending to buy a new domain. Once you get to the point where it asks you if you want to buy private registration, you may click it and it opens up a new area and shows you the private registration account number to use. This is your DBP user ID. Now you can head over to DBP’s web site and type in that account number as your user ID and your GoDaddy password. Please keep in mind, if you change your GoDaddy password, it does not automatically change your DBP password. It will use the password that was in use when you first registered a GoDaddy private domain. For me, I had changed my GoDaddy password, but my DBP account was still using the one before my password change.